Among the many new cigars introduced at the annual IPCPR Trade Show in Las Vegas last week was La Flor de Ynclan from Villiger Cigars. Actually, in the this case, it’s more accurate to say La Flor de Ynclan was re-introduced; Villiger originally debuted the line, which takes its name from an old Cuban brand, back in 2007. Ten years ago, a “small batch” of La Flor de Ynclan was crafted by Villiger with unsatisfactory results, leading to a decision to cease production. This 2017 re-introduction, therefore, isn’t merely a second go-around with the same recipe. 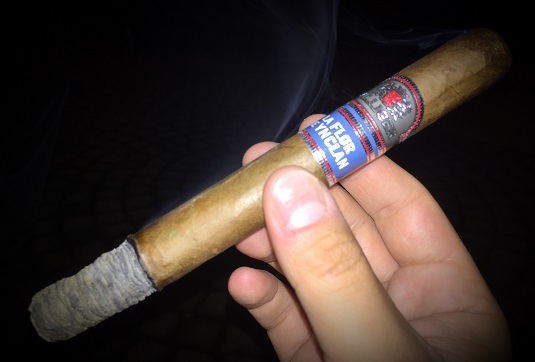 It has been re-blended by José Matias Maragoto—overseer of all Villiger-made product in the Dominican Republic—to feature an Ecuadorian wrapper, Indonesian binder, and Nicaraguan and Dominican filler tobaccos. La Flor de Ynclan is handmade at the ABAM Cigar Factory in the Dominican Republic in three formats: Robusto (5 x 50, $11), Torpedo (5 x 52, $12), and Churchill (7 x 48, $12). In addition to the new recipe, each has a redesigned band to maintain branding consistency across the Villiger portfolio (the 2007 La Flor de Ynclan band depicts an enrobed woman posing with two spears and one hand atop a globe). The Churchill sports a slightly pale wrapper with plenty of tooth, minimal veins, ultra-tight seams, and a few splotches of harmless discoloration. The cigar is moderately firm—and the cold draw is a little stiff—yet the foot shows a cross-section of loosely packed tobaccos. The gentle pre-light aroma is of damp wood and sweet hay. The draw opens nicely once an even light is established. At the outset, La Flor De Ynclan boasts a mild- to medium-bodied profile of oak, sweet cream, almond, cinnamon, and caramel. The texture is smooth and the smoke is cool. After about half an inch, a wonderful savory flavor of roasted peanut emerges to add depth. Thereafter, the taste remains fairly consistent throughout, save for the additions of white pepper, dried fruit, and hints of cocoa. Construction is just about perfect. The burn line is straight and true down to the nub with no need for touch-ups along the way. The ash holds incredibly well off the foot, the draw is moderate, and the smoke production is agreeable with a mouth-wateringly sweet aroma. Clearly, this is not an inexpensive cigar. It’s also not a cigar that’s likely to satisfy if you’re looking for a full-bodied experience. But if you seek a milder smoke with well-balanced complexity and ample nuance, the Churchill from La Flor de Ynclan will not leave you disappointed. I award this Villiger creation a very admirable rating of four stogies out of five.